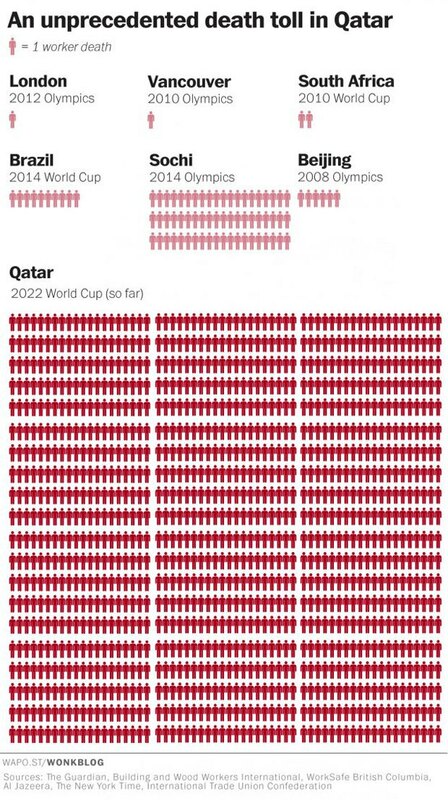 In the chart below, The Washington Post compared the number of deaths of construction workers involved in the last four Olympics and two World Cups to the staggering (and ongoing) death toll in Qatar. The Washington Post added the following update: This story has been updated to reflect the fact that figures include total migrant worker deaths in Qatar, not just World Cup-related deaths. Regardless, the facts remain the same: at least 12,000 migrant workers have lost their lives in Qatar since they started preparing for the 2022 World Cup in 2010, providing further evidence for the fact that FIFA is the worst.